I posted a FOTD on Instagram on Friday that was inspired by Jaclyn Hill. I used a MAC pigment that I picked up not too long ago as well as a couple of Makeup Geek eyeshadows. She did this look in a video on youtube, here. I thought I'd share it with you in a post with a review of the MAC Rose Pigment, rather just just posting a swatch on its own. So, for a quick review, pigments are something that I've used since I was a teenager, but I quit using for over a year. I find that I need more time and patience to use a pigment rather than a regular eyeshadow because they tend to be messy and some are more difficult than others to apply, even wet. I picked up the MAC Rose Pigment after watching Jaclyn Hill's tutorial, along with two of the three Makeup Geek eyeshadows she used, Peach Smoothie and Mango Tango. In her tutorial, she also used Razzleberry, but I don't have it and it's out of stock until May, sadly. MAC Rose pigment is a beautiful Rosey shade as the name suggests, but it has a beautiful copper shimmer in it that makes it totally unique. It's almost a rose-gold shade. It's so pretty and it looks amazing with green eyes, but it would look really pretty with any eye color, I'm sure. MAC Rose pigment is surprisingly easy to apply. Rather than apply it wet, I did what she did in the video and used a sticky base, and it worked perfectly. I had fall out while applying it, but I just removed it with a makeup wipe after I was finished with my eye makeup. Anytime you're using a pigment, glitter or a dark eyeshadow, it's good to wait to do your face makeup until you're finished with your eye makeup. The pigment stayed on my lid all day and didn't fall onto my eyeliner or cheeks, at all. MAC Rose Pigment retails for $21. The jar is huge and will probably last forever, not to mention it only takes the smallest amount, it's totally worth it. I'll probably buy more MAC pigments in the future. Now, onto the look & products used! Makeup Geek Mango Tango in crease & under lash line. BA Star Glitter Glue on lid to hold pigment. As always I used my Sigma brushes. My favorites are the F80(Flat Kabuki), F84(Angled Kabuki) and F40(Contour). Not only are they extremely affordable, but they've made a huge difference in how my makeup looks & I absolutely love them. I've had mine for quite a while now and even though I use them daily, they work as great as the day I got them! So, I totally recommend all of these products, and if you haven't already, go check out her video to see how I got this look! It's Weight Loss Wednesday! I'm trying to keep the numbers consistent; I honestly think it's week 12 or something, but as I haven't been posting the last couple of weeks, I've lost track. I could go back and count, but then I don't want to, so let's pretend it's week 10, okay? That's the most inspirational thing I could think of to post. 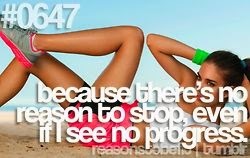 I love it & it keeps me motivated. 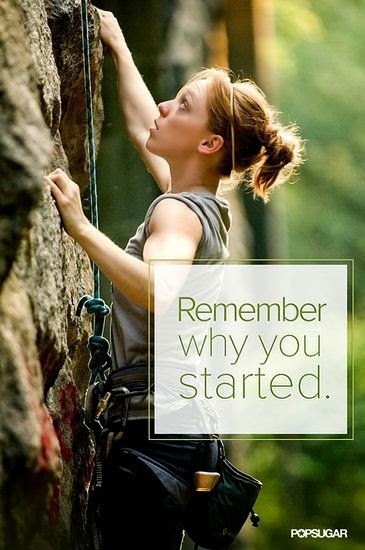 Always remember why you started. When you're struggling, think of why you started. When you think of giving up, think of why you started. Before you destroy everything you've worked for, remember why you started. It's important, and it will help. At some point, you're probably go to plateau. It's something you have to work through and sometimes it takes time. But, if you stop and forget what you're working toward you will have to start over. So, don't stop. Make it a lifestyle change, rather than a temporary fix. There will come a point where you're going to get frustrated, unmotivated, tired, annoyed, and you'll just want to give up. Take it from someone who has been through this cycle over and over for 7 years, don't. When you think of giving up, think of where you could be if you continue. If you've given up in the past, think of where you could be now if you hadn't given up then. This doesn't just apply to weight loss and fitness, this applies to everything. 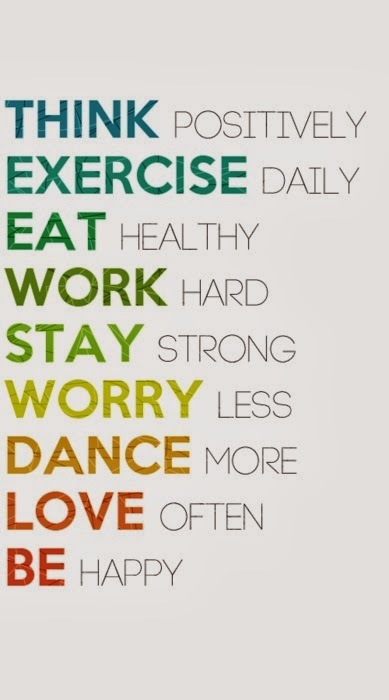 These are the things I'm trying to remember as I work toward my fitness goals *and* as I work toward getting back into and finishing school. That's something I've never talked about on here before, but I'll do that now. I've been in and out of college since 2005. I've changed my major at least 5 times, and I have a ton of credits. I could never decide what I wanted to do, and the last time I was in college I messed up. The first semester was fine, the second I failed a class because I was lazy. For failing a class, my financial aid was taken away. I had to fill out an appeal to get it back, and it was approved. I went back the next semester and failed another class, but this time it was because I genuinely did not understand and my teacher was, for lack of a better term, an egotistical, elitist shithead. What he essentially said to us was, if we were confused or did not understand, not to come back because we were too stupid to be there. 90% of the class failed, but I lost my financial aid again, and this time permanently. So, I'm heading back to college two years later. This time, I know what I want to do. I have a year left of school to finish, and I have to pay for it out of my own pocket. This is where what I previously said comes in. Consider where I could be if I had finished school the first time. I started in 2005 for Photography. It was a 5-6 year program, but I'd definitely be finished and doing something that I love, where as now I'm making barely enough to pay the car payment(seriously!) working in a tanning salon, and I've reached that point where I'm just tired, fed up and sick of working there for more reasons than I can count, but there's nothing I can do because there's literally no where else to work in this sad little town, so I'm stuck working evenings and weekends until I can find something better or finish school. This took a negative turn, so let's look at the positive. I'm reapplying for school & my husband is going to help me pay for it. I'll be finished with a degree (associates) in about a year, and I'll be able to (hopefully!) work from home at that point as a Web Designer. So, now that this is insanely long and way off topic, let's get back to the weight loss post, shall we? I had the flu, which caused me to drop around 10 pounds. Since feeling better I have been eating better and working out everyday. So, I'm officially 14 pounds down over the last two weeks. I've eaten nothing but healthy food & I've drank nothing but water. I'm rarely hungry and struggling to eat 1200 calories a day, so I'm trying to make myself eat enough. I'm back down a size & I feel a lot better. Let me know how you've been doing if you're also trying to lose weight. Leave any healthy recipes if you don't mind! I'm always looking for something new to try!